I was born March 17, 1884, in the small village of St. Joe, Searcy County, Arkansas. The birthplace of my father was Springfield, Illinois, and that of my mother Marietta, Georgia. At the age of seven symptoms of a weakness for the earth sciences began to manifest themselves. Armloads of limestone slabs filled with crinoid stems were carried into the house for inspection, and when I asked why these rocks were filled with worms, was emphatically ordered to return them to the hillside and to refrain from further foolish questions, as these were just rocks and nothing more. When I was nine years of age, my parents migrated to Indian Territory. There I found the geological picture greatly changed and much more interesting. Along the eroded banks of the Arkansas river were innumerable veins of coal outcroppings. Between these and beds of concretions filled with pastel shades of clay I spent many happy days. When my father found a lot of these multicolored clays smeared all over the side of the barn another of my geological endeavors was quickly and decisively squelched. Educational advantages in the Indian Territory at that time were practically nil. During the six years of residence there, only a few intermittent months of “Subscription School” were available, and principally for that reason my parents decided to follow the course of empire westward. Acquiring two covered wagons or "prairie schooners", we loaded in and for three long months listened to the song of wagon wheels across the states of Kansas, Colorado, Wyoming and Idaho, reaching the green and fertile valley of the Snake river just at the opening of the harvest season. This so resembled Paradise in comparison to anything we had ever seen before that Oregon of course became our home. Among the many advantages to be found in this land of promise was one in particular which caught my interest. Just across the river in Idaho was a boarding school known as the Idaho Intermountain Institute. At this place one without means could secure enough employment on the campus to pay for both board and tuition. I contacted the school authorities at the earliest possible date, all arrangements were easily made, and I became an immovable fixture for four years. My arrival at this school should have created quite a sensation because I had with me all my worldly goods and these consisted of two sacks, one filled with clothing and the other with rocks. My second sack was to bring me deep disappointment. No one seemed to know very much about rocks, and cared less. One professor, however, was somewhat sympathetic and directed me to the Weiser Academy, located about half a mile away, where he thought I might probably get the desired information. The instructor was found and for a full hour he delved into the mysteries of mineralogy - all of which failed to register with me. This I know because when I returned to my school the teacher insisted that I explain fully to the class all I had learned about my specimens. To the best of my memory, those small yellowish-pink crystals were called "mizpahs". Later I learned that what the teacher had really said was that they were feldspars. Still the class marveled exceedingly - it was their first lesson in geology. After spending four years at this school, it became increasingly apparent that the seventy-five dollars which I could save during the three summer months would hardly support me in the lavish manner in which I craved to live through the nine-month school year, so I decided to spend a year or so in Alaska for the purpose of bolstering my modest fortune, and possibly locating a few of those elephants frozen in the ice which I had been reading about. The explorations of course proved fruitless, and the long, workless winter months exhausted my summer earnings to such an extent that when I arrived back in Seattle my fortune had dwindled to two dollars and fifty cents. It was then and there I made up my mind that what I most needed was a guardian, so I became an employee of the Post Office Department and remained in this position thirty-five years. It was during my employment in this position that I met and married Miss Berrie Horton, who has always shared my interest and enthusiasm in my lifelong avocation. During these many years as a government employee my interest in the earth sciences never lessened, but on the other hand grew and a very large portion of my spare time, such as vacations and holidays, were spent roaming the semi-deserts of the Northwest and exploring the fossil-bearing cliffs of the John Day country. In 1933 a semi-technical club was organized, known as the Oregon Agate and Mineral Society. This I joined as a charter member, having already spent fourteen years with the Mazamas. Beginning in 1934 and extending through several years, the University of Oregon conducted extension courses at the Lincoln High School in the following sciences: Geology, Dr. Edwin T. Hodge; Rocks and Minerals, Dr. W. D. Wilkinson; Paleontology, Dr. Earl Packard; Anthropology, Dr. Goldenweiser. From these sources I received all of my classroom geology. John Eliot Allen was born in Seattle, Wash., on August 12, 1908, the son of Eric W. (ex-dean of journalism at University of Oregon) and Sally Elliott Allen (writer and playwright). He was educated in the Eugene public schools, was graduated from the University of Oregon, where he received his B.A. degree in 1931, M.A. in 1932. In 1944 he received his Ph.D degree from the University of California. All degrees were conferred in his major field - Geology. In 1933 he was married to Margaret Moss of Portland; they have one daughter, Sallie Ann. She is married to Scott McNall and they have two children, Miles and Amy. Dr. Allen's professional experience includes being: field geologist for the Rustless Iron and Steel Corporation, 1935 to 1938; chief geologist for the Oregon State Department of Geology and Mineral Industries 1938 to 1947; and senior Economic Geologist with the New Mexico Bureau of Mines for four years. Dr. Alien has been or is a member of the following organizations: Phi Beta Kappa, Sigma Xi, Theta Tau, Geological Society of the Oregon Country (President 1946), Geological Society of America, American Geological Institute, Society of Economic Geologists, American Institute of Mining & Metallurgical Engineers, American Association of Petroleum Geologists, American Geophysical Union, American Institute of Professional Geologists, American Scientific Gem Association (regional vice president), Oregon Academy of Science, National Association of Geology Teachers (president 1967), and Northwest Scientific Association. His bibliography of publications includes some forty listings, ranging from the highly technical to the very descriptive. Many have been used by GSOC members for source and trip background material. Arthur Carhart Jones was born in Oberlin, Ohio, on September 11, 1896, the son of Rev. Burton and Angie (Tallmon) Jones. He was educated in the public schools of Kansas, California, and Oregon. His B.A. degree he received at Pacific University, Forest Grove, Oregon, in 1921. From the University of Oregon Medical School he obtained his M.A. degree in 1925, and in 1926 his M.D. Dr. Jones is a member of Sigma Xi, Alpha Omega Alpha, Nu Sigma Nu, and Gamma Sigma. 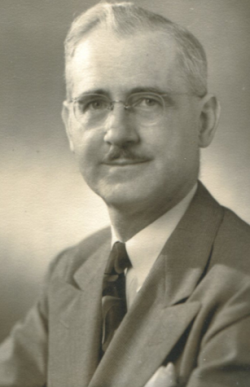 As a physician and Surgeon Dr. Jones was associated with the Else-Dudman-Nelson Clinic from 1927 until 1931, and since that date has been in private practice, except for the time spent in military service. He was associate in Anatomy at the University of Oregon Medical School from 1934 to 1940, and has been director of Physical Medicine there since 1929. During World War II he was commissioned as major and stationed at Letterman General Hospital in San Francisco, and at Mitchell Convalescent Hospital at Campo, California. Doctor Jones is an authority and pioneer in work on physical medicine and rehabilitation, and is one of the founders and medical director of the Portland Rehabilitation Center. Dr. Jones was married on September 18, 1924, to Doris W. Wolcott of Portland, Oregon. They have two children - a daughter, Ardis Carolyn, now Mrs. Donald R. McKay, and a son, Irving Wolcott Jones. After the tragic mountaineering death of Donald -R. McKay, Ardis was married to David G. Hitchcock. At a most beautiful wedding service at the First Presbyterian Church attended by 1200 of their friends, Dr. Freeda 0. Hartzfeld, Dean of Women at Lewis and Clark College, and Dr. Arthur C. Jones were married on October 1, 1965. Besides continuing their life-time individual interests, they have joined together in the state and national promotion of the Laubach Literacy program. Dr. Arthur is a member of the Board of Directors of the Laubach Literacy of Oregon, Inc., of which Dr. Freeda is president. Dr. Arthur has been known to say that he considers this volunteer program that is carried out in the disadvantaged areas of the world as well as in the United States to be one of the most Christian action programs possible. -Doris Wolcott Jones, 1964. Fay Wilmott Libbey was born in Macawhoc, Maine, on October 11, 1882, the son of Charles Otis and Josephine (Chadbourne) Libbey. He was educated in the public schools and at the Massachusetts Institute of Technology, where he received his B.S. degree in 1906. In December 1913 he was married to Rose C. Kaiser of Portland, Oregon. They have one daughter, now Mrs. John Swanson. Mr. Libbey began his engineering work as assayer of the Nipissing Mining Co. in Cobalt, Ontario; later was superintendent of the Vulture Mining Co. in Wlckenburg, Arizona; engaged in mine leasing in Arizona, and oil exploration in California. He was superintendent of the Pinto Valley Co. of Miami, Arizona; consulting engineer for the U.S. Engineers of Portland, Oregon; mining engineer for the State Department of Geology and Mining Industries, Portland, of which he has been director for the past six years (since July 1944). He was a first lieutenant with the U.S. Army Engineers in 1917. Mr. Libbey is the author of the following: Dredging of Farmland in Oregon; Progress Report on Coos Bay Coal Field; Mineral Deposits in Region of Imnaha and Snake Rivers, Oregon, and co-author of Manganese in Oregon; Preliminary Report on High-Alumina Iron Ore in Washington County, Oregon; and Ferruginous Bauxite Deposits in Northwestern Oregon. He is a member of the American Institute of Mining and Metallurgical Engineers; the Professional Engineers of Oregon; American Association of State Geologists. In politics he is a Republican; in religion, an Episcopalian. Leo Friedrich Simon was born in San Francisco on June 18, 1890, the oldest of nine children. At the age of 12, he removed with his family to Portland where he has since lived. His formal education was obtained in parochial schools in San Francisco and Portland, supplemented by numerous extension courses, beginning with a course in geology for the mountaineer scheduled by the Mazamas in 1922 and taught by Dr. Edwin T. Hodge. In 1916 he started a series of extension courses in a variety of fields covering chemistry, art appreciation, design, botany, paleontology, biology, taxidermy, and ornithology. Upon completing courses in geology taught by Dr. Warren D. Smith, Dr. Earl Packard, he rejoined the class that organized the Geological Society of the Oregon Country. In the spring of 1935 Dr. Hodge informed Leo that his class wished to organize a Society in order to further interest in geology and to continue field trips in the Oregon Country. The charter membership was closed with 100 members in October. After engaging in several different occupations, Mr. Simon found his greatest interest in photography; so for sixty-three years he has made it his vocation. He was married on August 12, 1918, to Johanna M. George. They had two daughters: Lotus, who is married to Dr. Wilmer J. Miller, has two sons, Douglas and Alan. They live in Ames, Iowa. Mitzi, now Mrs. Robert Connelly, had two children, Larry Cage and Mrs. Linda Landis who has a son, Paul. The Simon's family home is at 7006 S. E. 21st Avenue. Mr. Simon's activities in the Geological Society have covered a wide field, including, besides the position of president, those of vice-president, treasurer, director, the chairmanship of many various committees, trip leader on many occasions, Thursday luncheon chairman, and annual banquet ticket seller for 35 years. "... and still the wonder grew, That one small head could carry all he knew." Is there another man in Portland town who in his nearly four score years has so endeared himself to so many and who has so actively participated in so many facets of nature's world? Commercial Photographers Association, Member since 1924, Vice president 1930, Treasurer since 1930. Citation - Feb. 28, 1970 Sponsored by Raymond S. Corcoran, "The Oregon Academy of Sciences meeting in its annual convention has on recommendation of its council awarded this citation to Leo F. Simon in recognition of outstanding services to the state of Oregon in the field of science." Award - Bronze Medal, 1968, "Thirty years faithful service"
Leo spends many happy hours with interests in his home and yard. His stamp collection which numbers in the thousands has taken him on many journeys around the world and acquainted him familiarly with numerous far away and out of the way places. He keeps a collection of rare dried plants and flowers in his home and agate, mineral, and fossil specimens, each of which he is able to give technical data about and its scientific classification and name. His yard is a sanctuary of wild flowers and plants. Every identification of wild flower trip to Bird Creek Meadows on Mt. Adams or other alpine trip finds Leo to be an authority for identification as his life-time familiarity is treasured. The recent Academy of Science citation was one of special significance to Leo. This acclamation of respect accorded him by professional men of science was to him the epitome and "greatest honor that ever happened to me."